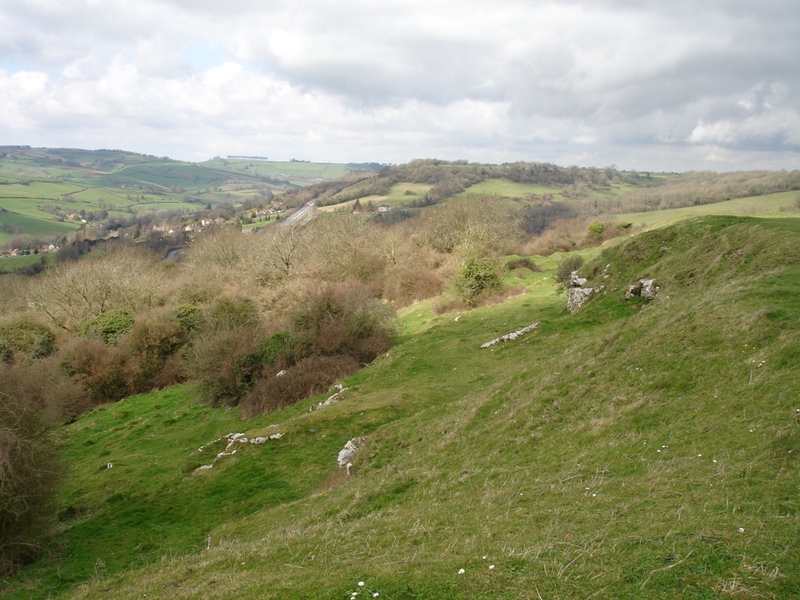 The National Trust – Little Solsbury Hill is a walled village of the early Iron Age, occupied from about 300 bc to 100 bc. At first the area near the edge of the hill was cleared to a rock base, on which substantial timber framed houses were built. A 20 feet wide rampart was then made, faced inside and outside with well built dry stone walls and infilled with loose stones . The outer face was at least 12 feet. After a period some of the huts were burnt down and the rampart was overthrown, the site was never occupied again. So says the National Trust sign that greets us at the gate to this hill fort. 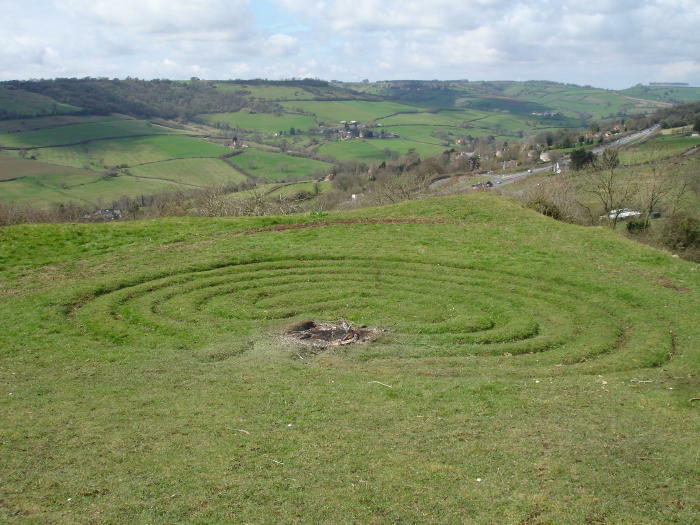 Solsbury Hill as it is better known, stands just outside Bath, it is on a high eminence and a walk up the steep lane, with the car parked down in the village of Northend, is the best way of getting to the top. It occupies a spectacular position, the Cotswolds are just coming to an end here, and the River Avon curves on its way past below. But it is the A46 road that lies in the valley under the hillfort that was the scene of a road protest in 1994, it is perhaps remembered best for. The controversy that surrounded the widening of the A46 road was to bring to a halt a further 300 road widening schemes which the conservative government of the time was trying to implement. Sadly it did not stop the road widening scheme under the hillfort, and a grass maze today overlooking the road is a reminder of the ‘tree top’ protest of 1994. This was not the Stonehenge ‘Battle of the Beanfield’ spectacular, but it caused much controversy in Bath at the time because of the force used against the protesters by both the police and security guards. It was beautifully documented in a book by Adrian Arbib, and this montag of photographs illustrates the young people who stood up against this road scheme. Today, a different generation of eco-warriors or protestors, will still take to tunnels or stand firm against the ‘might of the law’, as the protest against the motorway under the Hill of Tara showed, or in the case of the Prittlewell ‘Bling’ king protest at Southend, another road scheme. There is of course the ‘eagle’ featured in Peter Gabriel’ music, he wrote a famous song about this hill, and though there are not many that have seen an eagle fly above this hill (if any in fact) it is well to record for posterity, the small histories of Solsbury and not to forget of course, that it maybe one of the (many) conjectured sites to have hosted the Arthurian Battle of Badon.